Commentary: What Don’t You Understand About All Israel? The story of Israel, it has often been remarked, is a tale of two cities: secular Tel Aviv and religious Jerusalem. They are indeed different worlds: one with universalist aspirations, another with competing particularisms; one facing Europe, another tilted toward heaven. They are also shorthand for two movements in Zionism—and a local version of how Athens and Jerusalem stand for two poles of Western civilization. Of course, the analogy is imperfect. There are cafés and technology parks in Jerusalem, and plenty of religious residents of Tel Aviv. But the deeper problem is that Jerusalem and Tel Aviv, or rather, the cultures they represent, often overlap. Last August’s attack on a gay youth support group in Tel Aviv, for example, in which two were killed and 15 wounded was a painful reminder that the two-cities story has both its merits and its limits. On the other hand, these political and cultural gains far outpace Israeli society’s actual acceptance of sexual diversity. The kids at the Tel Aviv youth center were perfect examples of the conundrum even before the tragic attack. Yes, they were in a support group run by the Israeli Gay Youth organization (IGY), in a city whose recent public relations campaign bills it as “the pink city.” But they needed that support because their families were often hostile to them, in some cases even disowning them. Indeed, in a tragic footnote to a tragic situation, some of the wounded children’s parents were so surprised, upset or ashamed by the revelation that their kids were gay that they did not even visit them in the hospital. The story gets worse. According to the Israeli Welfare and Social Services Ministry, one third of teenage suicides in Israel are kids questioning their sexuality. (Such statistics, by the way, belie the claim that sexuality is some kind of lifestyle choice—who ever killed themselves because of a choice?) American statistics are not so different. In fact, Israel’s two cities aren’t so neatly divided. Tel Aviv may be the pink city, but gay kids are often born not there but in Jerusalem, Kiryat Gat, Afula, Efrat and Nazareth. Gay kids are usually not born into gay families. Unlike in the Jewish world, in which ve-shinantam le-vanekha—and you shall teach your children—is a cardinal rule, and in which Jewish culture and religion are taught and celebrated from an early age, GLBT (gay, lesbian, bisexual and transgender) children are often not only deprived of education and celebration of their identities but scorned, shamed or worse. If only Jerusalem and Tel Aviv were tidy categories, neat little boxes with one sort of person in one category, another in another. If only they were as geographically contained as the metaphors suggest. But they’re not. Many of us, in Israel and abroad, live in “Jerusalem” one moment and “Tel Aviv” the next. What, then, are we to do, if we care about all children being safe and supported? Well, obviously, groups like the one in Tel Aviv (and the Open House in Jerusalem) remain absolutely essential and deserving of our support. I run a national GLBT Jewish organization here in the States, and I can say from years of experience that however far we think we may have come on gay issues, for some people, it’s always square one. Every week I come across people whose families won’t talk to them, or who believe their capacity to love to be a curse rather than a blessing. Growing up in “Jerusalem” is hard. But there are also less obvious lessons to be drawn, and they extend well beyond GLBT people specifically. 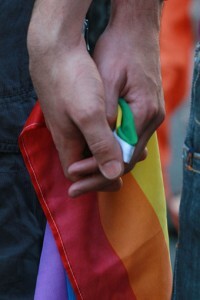 The first is that, in light of the sheer quantity of suffering that GLBT people continue to face, and the fact that such suffering is remedied not by policies and laws (though of course these help) but by shared attitudes and opinions, we each have an ethical responsibility to “do our homework” on gay issues. Just as the women’s movement challenged many of our basic assumptions about gender roles, and took a lot of getting used to at first, and just as the civil rights movement was a call to each of us individually to examine our consciences, so too questions of gay rights demand quintessentially Jewish introspection and questioning of what we think we know. Fortunately, there are great books and Web sites out there that can teach you more than you ever wanted to know about the nature of human sexuality, the lives of gay people and the ways in which religion and sexual diversity can coexist—indeed, thrive. Of course, the best way to learn about gay people is to actually ask one. Studies show that attitudes toward homosexuality most often shift when people actually get to know gay people and find out that, well, yes, two men under the huppa may seem radical at first, but when you actually know Adam and Steve personally, it seems like the most natural, banal thing in the world. A second, and related, lesson is that all of us share responsibility for creating the Jerusalems and Tel Avivs our children unwittingly inhabit. Of course, all of us who love Israel must condemn the inflammatory and ignorant rhetoric about gay people that issues forth from some political-religious quarters. But the mere absence of persecution is not enough. When you’ve been told for 20 years that something about you is loathsome and horrible, it takes more than neutral “tolerance” to change that view. Thus, in a context as fraught as this, each of us is either part of the solution, or part of the problem. Silence is not neutral. Public, proactive steps, like Prime Minister Benjamin Netanyahu’s historic visit to an Israeli GLBT organization after last August’s attack, are appropriate, necessary and laudable. In private, the work is harder; we all have to “sweep our own sidewalks,” so to speak, ensuring that we’re not perpetuating a culture of closets, shame and deception through our acts of commission or omission. I’ve heard lots of homophobic speech in my life, from the simple “that’s so gay” to truly nasty stuff, and most of it was when the speakers thought no one gay was around. Tip: There probably is someone gay around. And we may be hurting that person without even knowing it.